NASA has no answers for imposible camera position. In 2012 we looked at some Apollo 11 film footage and noticed something that we did not see in the Hasselblad still images. In the 16mm film footage you can see the Landing Point Designator (LPD) on the window of the Lunar Module. The LPD is a set of scribe marks on the inside and outside windows. The Commander looks through the LPD and the angle tells him where to look along the vertical scale to find the place where the computer thinks they are going to land. Why are the LPD lines only showing up in the 16mm film footage and not in the Hasselblad still images. The first answer we got from the ALSJ was that the Hasselblad camera was positioned so that the LPD would not be in the field of view. We didn't buy this answer and soon found evidence to show that the LPD should have been present in the Hasselblad camera's shot. The animation image we made shows a 16mm film still shot vs the Hasselblad image 5843. You do not have to be a rocket scientist to see that both cameras are in almost the same position. However we needed hard proof. The proof that the LPD was indeed in the Hasselblad's field of view came from a reflection we found in Apollo 11 image AS11-39-5843. 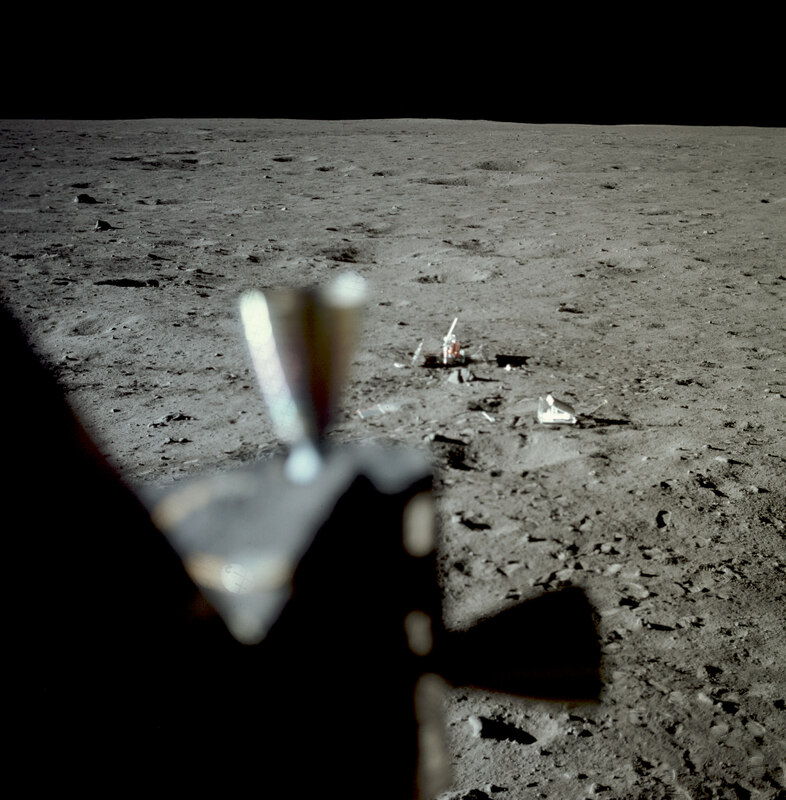 For over 40 years a tiny reflection seen in Apollo 11 image 5843 went unnoticed by NASA. Perhaps it was a whistle blower who ingeniously left us a clue that the Apollo 11 moon landings are a hoax? When we discovered the reflection we reported it to our ALSJ contact and received the following email response the same day. 1. This proves that the actual LPD markings were within the field of view of the Hasselblad camera even though these markings are so extremely out of focus that one does not see them on the right half of the photograph. 2. An optical engineer, if provided with the optical specifications for the 80mm lens, said specifications to also include the exact position of the aperture diaphragm, and if provided with a 3D model of the LM window which includes the placement of the LPD markings, can perform ray tracing in order to precisely determine the exact location of the camera and lens when this photograph was taken. Modern ray tracing programs are readily capable of showing everything which the image plane (the film plane) should see, based on the lens parameters and due to any and all internal reflections within the optical system of the lens. 3. Multiple intense reflections of the aperture and overlaid LPD markings are visible along the left side of the forward port vertical RCS thruster. These reflections can serve to further constrain and refine the exact position of the camera lens. In a nutshell, your discovery can be used by experts in optical raytracing to precisely determine the position of the Hasselblad camera and its 80mm lens when photograph AS11-39-5843 was taken. We also reported a reflection from another Apollo 11 image, AS11-37-5548. With the number 2 LPD marking upside down and the lines of the LPD beside it. This discovery raises many questions that need to be answered. For example why is the number 2 upside down? How can this reflection be so clearly seen in the RCS Thruster? And the most interesting question, what was the position of the Hasselblad camera? According to our ALSJ contact it should be possible to calculate the position of the Hasselblad camera. If this is true then they have been sitting on this information since 2012. Could it be that they have done these calculations and found that the Hasselblad camera is in an impossible position? In other words the footage was shot in a studio environment. Also read: Houston you have a problem!